It's humpday! Time for some confessions. Fair warning, we get a little rambly this week. HEY that's my first confession! boom. I read this article the other day, cried like a baby [like a girl? ], then I tried to remember when my argument stopped being "oh yeah? practice hard and maybe you can throw as well as a girl too!" and started being "I do not, I can throw just as well as you can!" I don't give a damn that this is part of a marketing campaign, I love the message. Just like the whole Pantene thing and the ban bossy movement. Then I made the mistake of reading the comments and I got so irrationally angry at idiots on the internet. First there are the guys who say "men are stronger than women in every way, just stating facts" then there are women who are saying "this is just as bad as using that as an insult because you're making stereotyping videos like this" to that, I just want to say "did you watch the whole thing?" where the message is that there's absolutely nothing wrong with doing something like a girl, because you are, in fact, a girl? Duh. While we're on the subject of girls..
Don't read those video comments either. I might have fought the urge to cry last night after we only got 1 minute of stoppage time and didn't quite make it. I really really wanted the USA to go all the way. Imagine everyone's reaction if the USA won the whole thing? Everyone would be so pissed at us. I was not clever enough to change the Secretary of Defense to Tim Howard though. Sassy Wikipedia entries have to be my favorite part of technology. Why do I never think fast enough for this? Although I unpacked everything I took into my apartment, I have been driving around with all of my shoes in the backseat of my car since Saturday. So I'm sure that is helping out with my gas mileage. Whatever, I don't want to carry them down all the stairs, so whenever I get a good parking spot I'll unpack them. I've been a little hesitant applying to jobs lately. I just got a rejection email from a job I applied for in 2009. How is that even a thing? Anyway. I've been told "no" a lot lately and it's taking a bit of a toll on my self esteem. Also. I really like that Girl Meets World show. I don't care what you think about it unless you like it too. Then we can be friends. 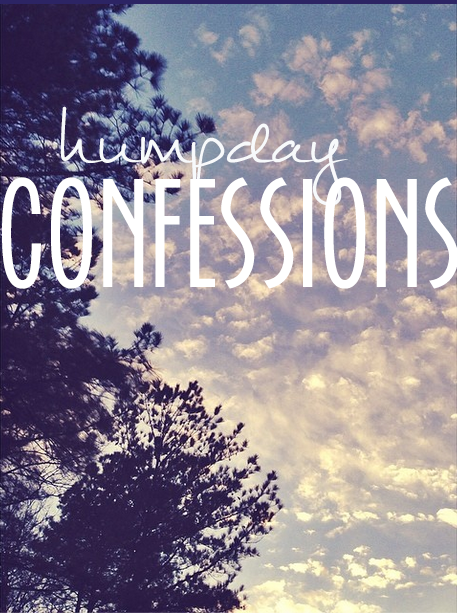 So these are my confessions, what are yours? Check out all the other ones over at Vodka + Soda! Ugh, article/video comments. I skip them whenever possible, but sometimes I forget and then am sad/angry for so long afterward. There's a twitter account that sends out useful reminders about why comments should be avoided, and I'm a pretty big fan: https://twitter.com/AvoidComments. Reading people's comments are articles like that is always so frustrating. I don't get people- ever. the comments on videos are awful; youtube is THE WORST. i think all the trolls hang out there. I felt really bad for USA when they lost Tim Howard was brilliant! I haven't watched Girl Meets World yet but I want to! If it's anything like Boy Meets World, I'll love it. I LOVE Girl Meets World...and really don't care who knows!! HA! !